When I discovered how easy it was to make hummus, I wondered why I had ever purchased it in the store! 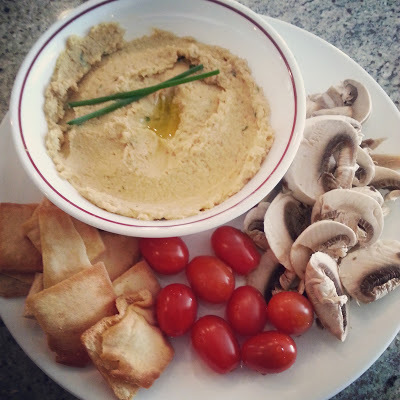 With only a few ingredients you can make a fresh and delicious hummus. I like to pair it with Stacy's Pita Chips, Gluten Free crackers and of course fresh veggies like cherry or grape tomatoes, mushrooms, peppers, etc. Empty 1 can of chickpeas into a blender with three cloves of diced garlic. Add in 1/2 teaspoon cumin, 2 tablespoons lemon juice and 2 tablespoons extra virgin olive oil. Don't buy the low sodium chickpeas or it will end up being too dry and you'll end up adding sodium into it. I love olive oil and the highest grade is Extra Virgin which means that the oil was made within 24 hours of the olives being pressed. However, even purchasing olive oil can be tricky. 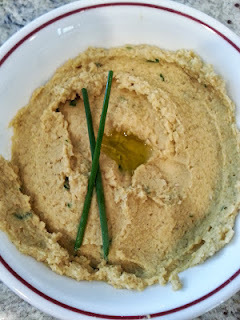 For presentation, make a dip in the middle of the hummus dish and add in some olive oil. 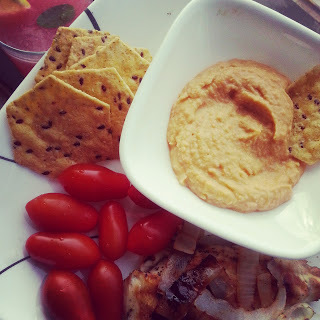 So there you have it, a super easy way to make a basic hummus dish. This is a quick and easy appetizer to make for guests and is healthier especially when paired with fresh veggies. Don't be afraid to experiment and add in seasonings or other foods you enjoy. Check out my optional ingredients list above for some ideas! Once I made my own hummus I never went back to buying it premade. Its so much better and super easy. yum! I've never tried hummus before, but I heard that it's so good for you.